These cats are what I call the next generation of blues legends. While their style is infused with the deep tradition of the Delta sound and technique, what they bring to the art is as fresh and original as any blues jam should be. \"Blues is our Business And Business is Good!\"
Izzy & Chris were united at an open stage in the summer of 2006. The duo performed a few songs together and got a standing ovation from the crowd. From that moment forward, it was evident the chemistry, the love of the blues, and playing from the heart, will keep the two together \"Preachin The Blues\" for many years to come. Only a few weeks after meeting they were main stage performers at the 2006 West Virginia Blues Festival. Izzy, born in Weirton, West Virginia, began playing guitar at the age of nine. At the age of 17 while visiting New Orleans LA everything changed for Izzy when he purchased a Robert Johnson album at a flea market off of Bourbon Street. Since that moment Izzy has dedicated his life and music to the blues. Chris, born in St. Louis, Missouri, began playing piano at the age of seven. It was not until later in life he began playing harmonica. After playing open stages for a couple of years, Chris got a break. He became the harmonica player for the late, great Pittsburgh guitarist \"Smokin\' Joe\" Bisgella. After Joe\'s death in 2002, Chris committed himself to playing music. Izzy\'s journey with the blues continued as he played countless blues clubs and bars from Pittsburgh to Memphis, and throughout the Southeast. Highlighting this point in Izzy\'s journey was winning best solo acoustic act at the Western Pennsylvania Blues Society Competition in 2006 and then becoming a finalist at the International Blues Competition held in Memphis. 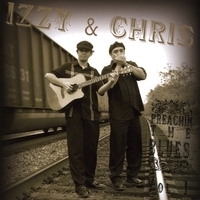 In May of 2007, Izzy & Chris signed a recording contract with 80/20 Music Entertainment and have finished recording their first release together titled \"Preachin The Blues...Vol 1\" at Grammy Award winning studio Audible Images. Since signing with 80/20, Izzy & Chris have also had the opportunity to play live with such legends as Buckwheat Zydeco, Watermelon Slim and The Blind Boys of Alabama. Izzy & Chris have been winning over many fans with their AMAZING live performances. They most recently won over the West Virginia Blues Society judges taking first place honors among the solo/duo acts at the Appalachian Blues Competition in Charleston WV which earned them a spot in the 2008 International Blues Competition in Memphis TN. Can't wait for more from these guys. Both harp and guitar players will enjoy this CD. These guys sound great! However, the person that wrote this spelled my late, great uncle's last name wrong...Bisceglia. Happens frequently with a last name like that. Thanks. Can I Get and Amen!!! Can I get an amen?! There's been a lot said and written about acoustic artists Izzy & Chris over the past few months. So much so I hesitated to say anything more. But after last week, I had to. AMEN! Thanks to Jack Rice of the West Virginia Blues Society, I had an opportunity for a sneak preview of IZZY & CHRIS new CD. "Preachin' the Blues...Vol I" which has yet to be released. But I've got just one question... how can, and I don't want to sound the least bit racist, sexist, genderist, ageist, regionalist or any other 'ist's... but how?... How can a couple 20-some year old white boys from Weirton, WV possibly manage to play and vocalize with the soul of a couple 70-some year old black guys from Friars Point, MS? AMEN! When this CD finally is available to the public, be certain to get one for yer ownself. Don't ask me, or anybody else to "burn" you a copy, cause these old soul-youths need and deserve your support. AMEN! I'd been a fan of Izzy Stetar since he entered the River City Blues Competition a few years ago. Even though he didn't win, everybody who was there that day just knew he had "it". And if he stayed with "it" then he was gonna be something special. I didn't know Chris Nacy until he started playing with Izzy. His harp playing takes a backseat to nobody and these guys together make up a true dynamic duo. Yeah-yeah-yeah I know, in this time of "the next best thing" it's hard to believe too much of anything we hear or see. So I guess you're just going to have to go out and see these guys for yourself. And when this CD is on the shelf of your favorite music store, "buy it". AMEN!